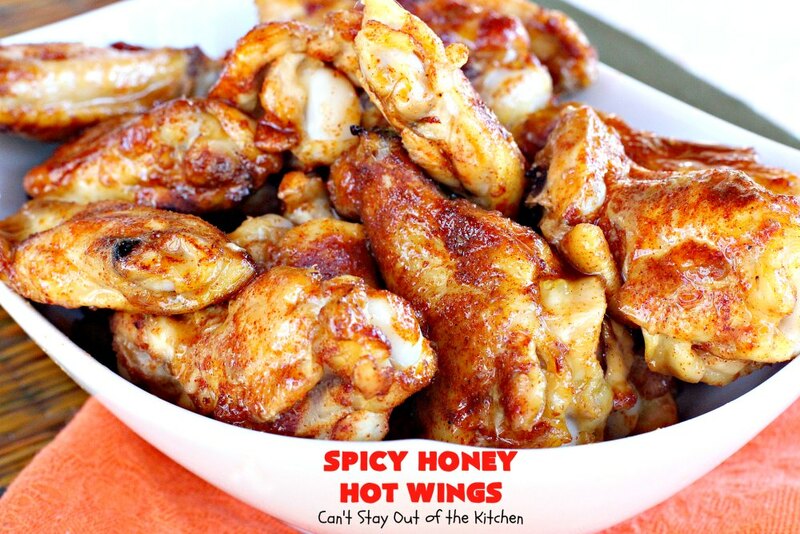 Spicy Honey Hot Wings is one incredibly amazing appetizer! 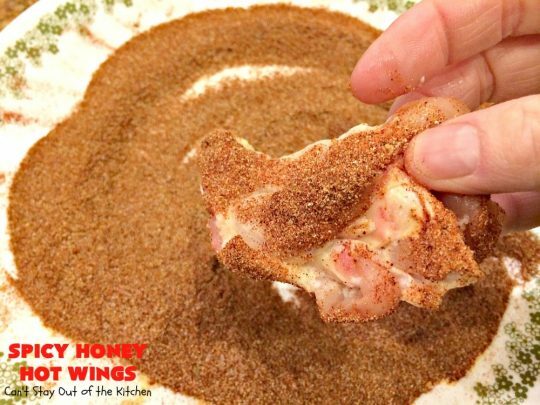 These wings can be prepared hot and spicy by dredging the chicken wing drumettes in the seasonings, or have just a lightly-flavored spiciness by sprinkling the seasonings over top of each side of the drumettes. 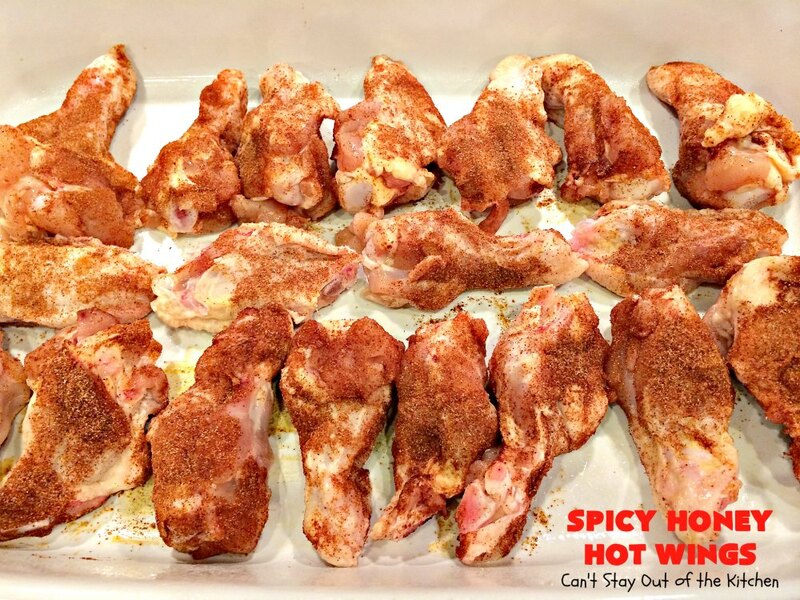 Either way is terrific, although I personally prefer dredging the wings in the seasonings for full flavor. If you’re serving adults, I highly recommend you go for it and coat the chicken wings well. If you’re serving kids you may have to back off the seasonings a little. The combination of seasonings is incredible. Then, when you add a honey plus apple cider vinegar basting sauce, the chicken just morphs into something spectacular. We were having a houseful of company last week and I decided to have a finger-food luncheon after church instead of my usual meat and potatoes or pasta-type meal. I looked online for chicken wing recipes and fully intended to try one of them. But I decided to base this recipe on another chicken recipe I adore. I was remaking that recipe anyway so I could get some decent pictures, so I decided to serve these tasty hot wings along side. We served plenty of tasty recipes that day including Easy Turkey and Cheese Tortilla Roll Ups, Veggie Tortilla Roll Ups, Spicy Honey-Brushed Chicken Thighs, Slow Cooker Cocktail Meatballs with Sweet Baby Rays BBQ sauce (! ), along with several other delightful appetizers and goodies. That’s not even to mention all the other treats brought in my our guests. Yes, we had an abundance of food, and thankfully we served plenty of people with good appetites. We had quite a feast that day. 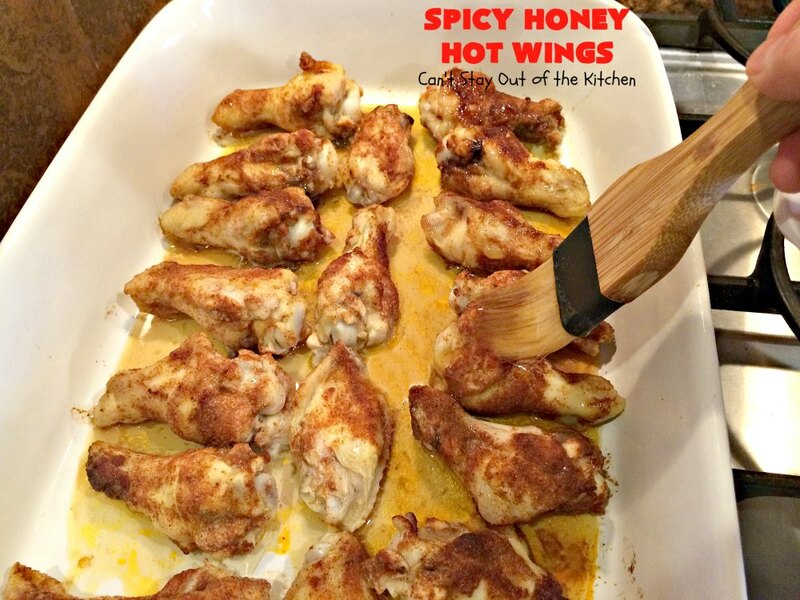 Even the kids enjoyed these wings, although my personal preference is to go for it and make them HOTTER!!! The nice thing about this recipe is you can actually find drumettes already cut up at the store, so the recipe is pretty quick and easy (especially if you don’t have to make a triple-batch like I did). Although we purchased whole chicken wings and my husband cut them up for me. The recipe I provide is for a crowd! You will probably want to cut it down to a third of my ingredients list. I used 60 chicken wings or 120 drumettes when cut apart. 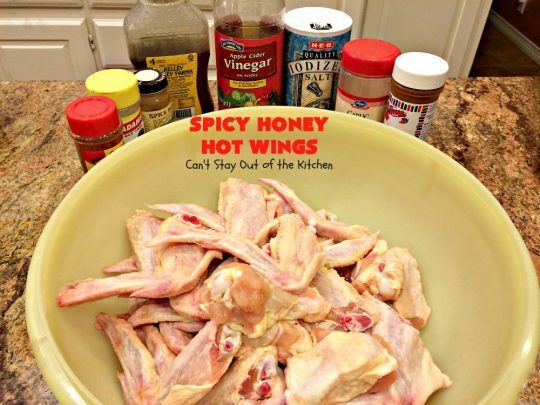 So unless you need that many wings for your next party, cut the recipe way back. If you want a spectacular wing recipe for the Super Bowl, tailgating parties, or just because you love hot wings, then consider making up a batch of Spicy Honey Hot Wings. I didn’t serve them with any cooling sauce, but you can always serve them with a sauce if you desire. Regardless of how you do it, just serve them!!! Spicy Honey Hot Wings are absolutely mouthwatering! 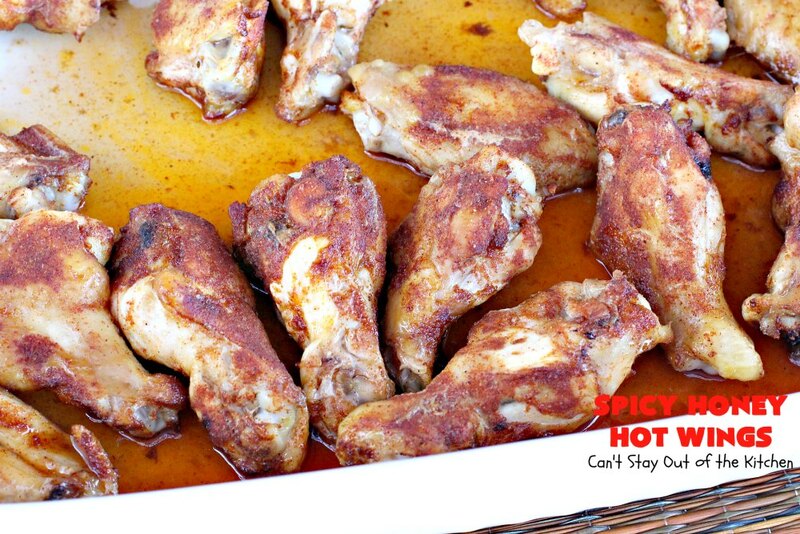 Spicy Honey Hot Wings are great to serve for tailgating parties or the Super Bowl! They’re also a good choice for backyard barbecues and family get-togethers. Everyone loves them. 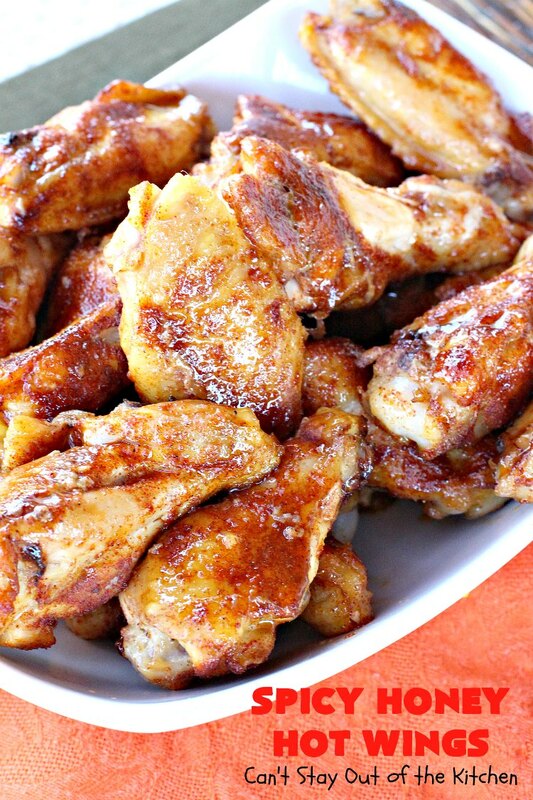 This gluten free recipe is actually a healthy way to serve hot wings. I used these ingredients. (I had another larger bowl of wings also). We cut off the wing tips after this picture. Measure ingredients out onto a plate. For premium flavor, dredge drumettes in seasoning. Grease a glass baking dish (I used 5 for all my chicken pieces). Place chicken pieces in baking dish, but don’t overcrowd the chicken. You can tell from this picture that I only sprinkled the meat with the seasonings and did not dredge deeply. We had children we were serving, so I was afraid they wouldn’t be able to eat really spicy wings. Bake chicken for 30 minutes at 350. 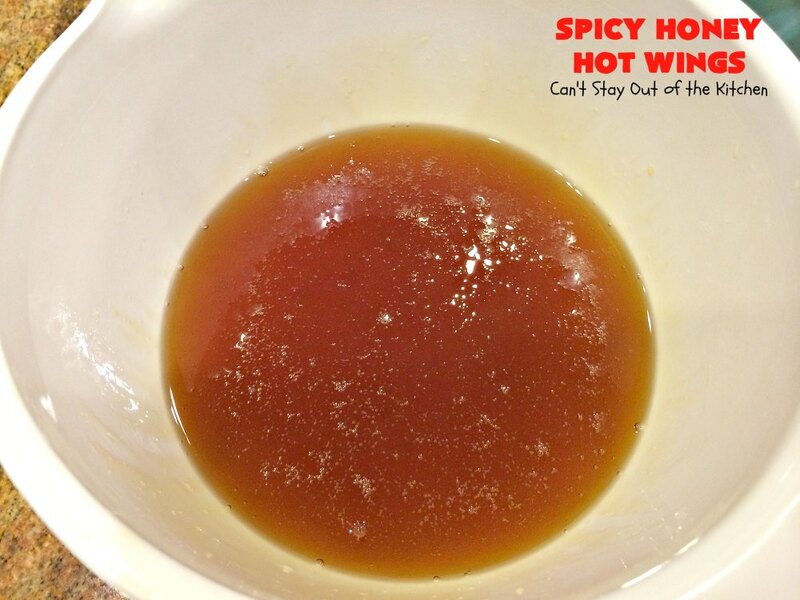 Mix apple cider vinegar and honey in a mixing bowl. After 30 minutes, remove chicken from oven. 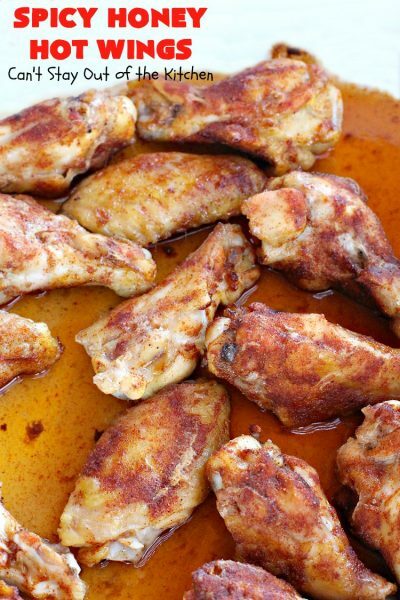 Baste the tops of the chicken wings with honey sauce. Return to oven for 5 minutes. Remove from oven and baste again. Turn chicken pieces over and baste the other side. Return to oven and bake 5 minutes longer. Baste again before serving. Using tongs, remove wings from baking dishes and place on platters. Brush more sauce (left in the baking dishes) onto the wings again before serving. I ate a lot more than my share of these tasty wings. Plus I heated the leftovers up for lunches the next couple of days! Yum. 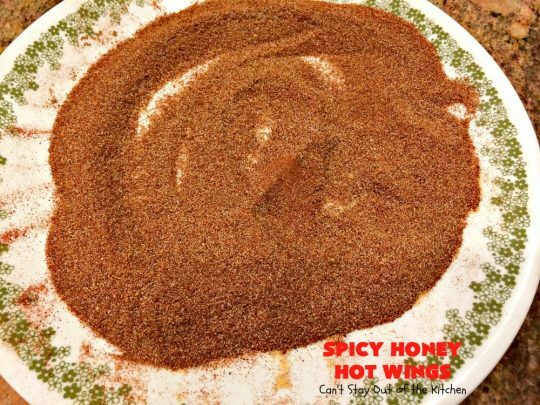 If you enjoy hot wings as appetizers for your parties, you’ve got to give Spicy Honey Hot Wings a try. They’re fantastic. These juicy wings will have you drooling. My recipe makes a lot if you’re expecting a lot of company. But if not, cut the recipe in half. 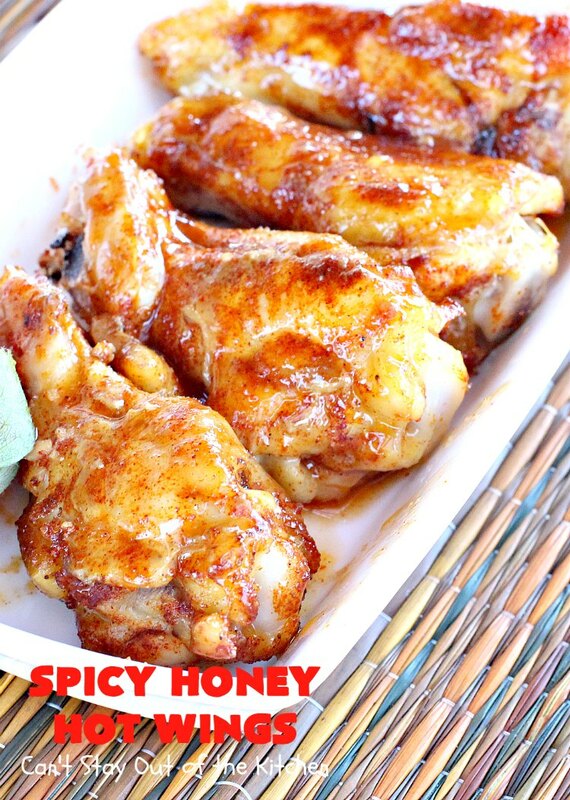 These hot wings are sweet and spicy and have awesome flavor. 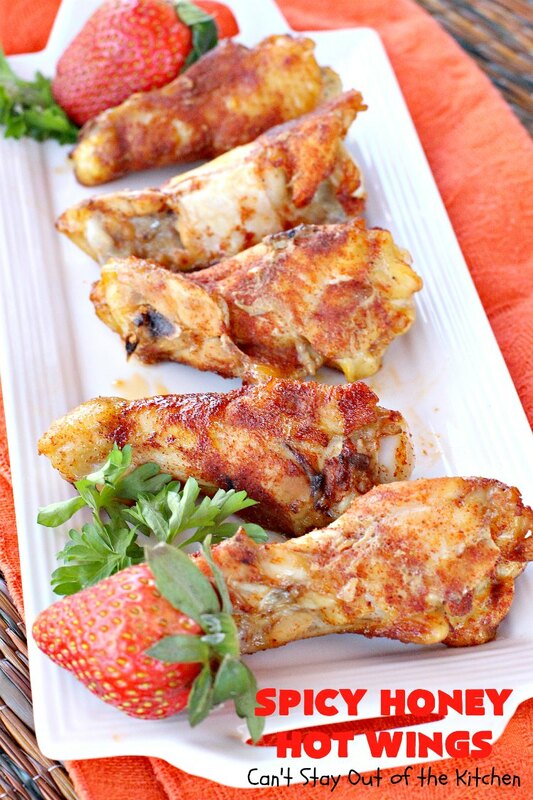 Fabulous tailgating or Super Bowl recipe. Gluten free, healthy and low calorie, too. Combine the garlic powder, chili powder, salt, cumin, paprika, and cayenne pepper on a plate. [u]For really spicy flavor[/u]: dredge chicken pieces in spices. Place in greased baking dishes, but don’t over-crowd. 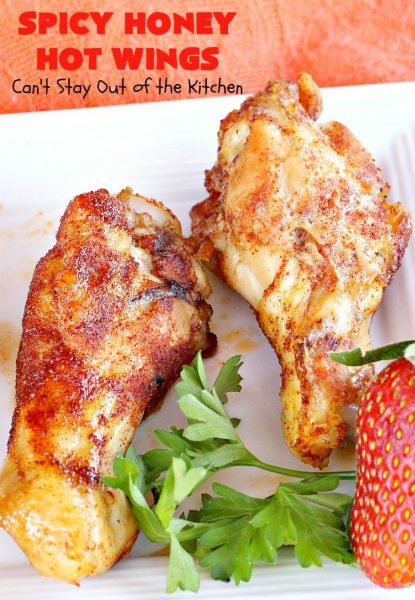 For just a hint of spicy flavor: sprinkle both sides of the drumettes well with the seasonings. 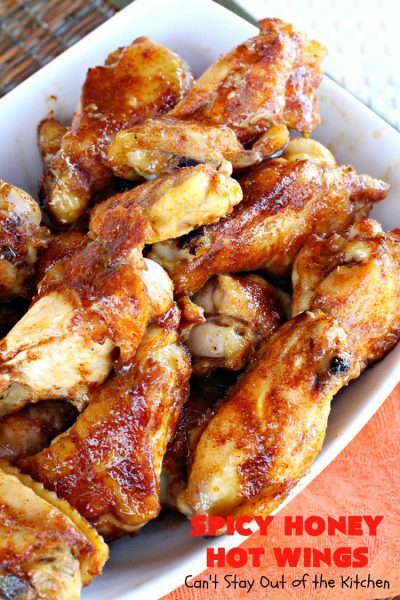 Place chicken in a greased baking dish and bake 30 minutes. While the chicken is baking, combine the honey and vinegar in a small bowl, stirring well. When the chicken is cooked through, remove from oven. Brush chicken pieces with the honey mixture. Bake an additional 5 minutes, baste chicken, turn pieces over baste remaining side and bake an additional 5 minutes or until chicken is crisp. Baste chicken wings again before serving. NOTE: We were cooking for a crowd. You can easily reduce this recipe by 2/3 and use 20 drumettes. You will still get 10-12 servings. NOTE: I was cooking for families with small children so I decided to sprinkle the seasonings on the chicken wings so the kids wouldn’t be overwhelmed by the spices. 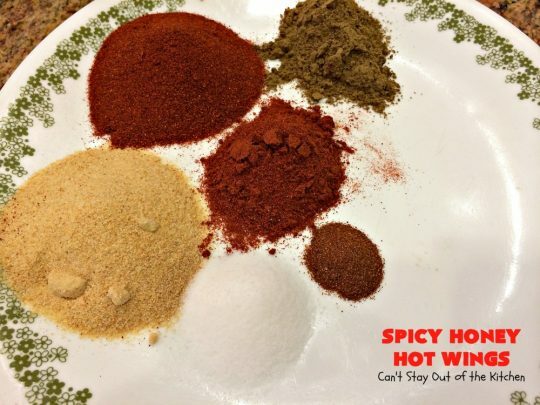 If you choose to dredge the chicken pieces in the seasonings you will need more spices and may have to make up an additional one-third batch or so. 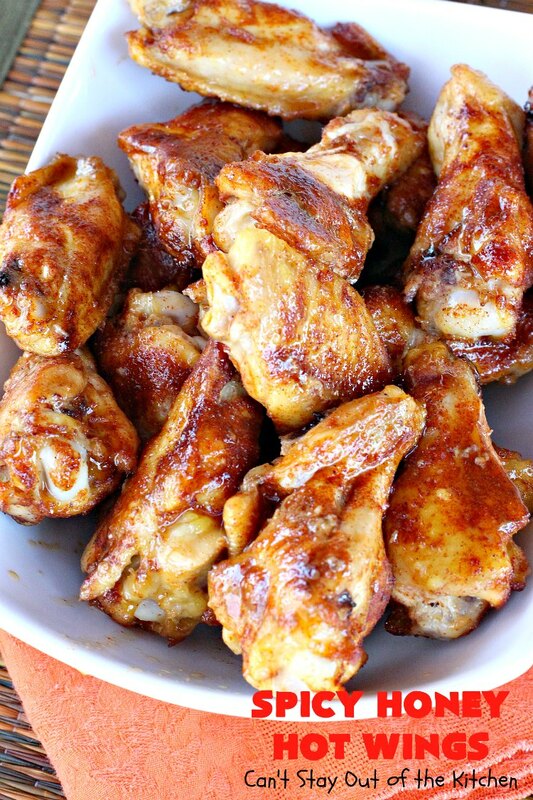 [u]For just a hint of spicy flavor[/u]: sprinkle both sides of the drumettes well with the seasonings. We were cooking for a crowd. You can easily reduce this recipe by 2/3 and use 20 drumettes. You will still get 10-12 servings. 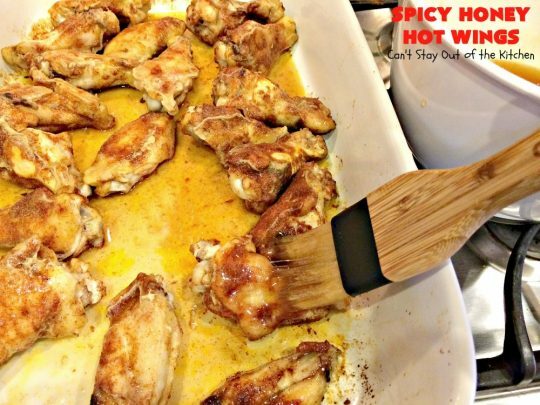 [br][br]I was cooking for families with small children so I decided to sprinkle the seasonings on the chicken wings so the kids wouldn’t be overwhelmed by the spices. If you choose to dredge the chicken pieces in the seasonings you will need more spices and may have to make up an additional one-third batch or so. 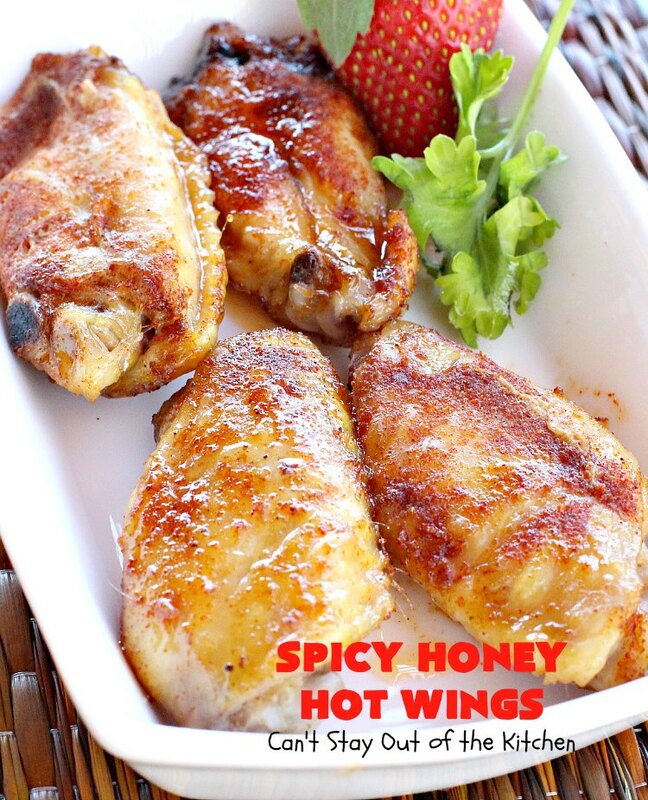 If you enjoy a sweet and spicy chicken wing, you’ll love Spicy Honey Hot Wings. 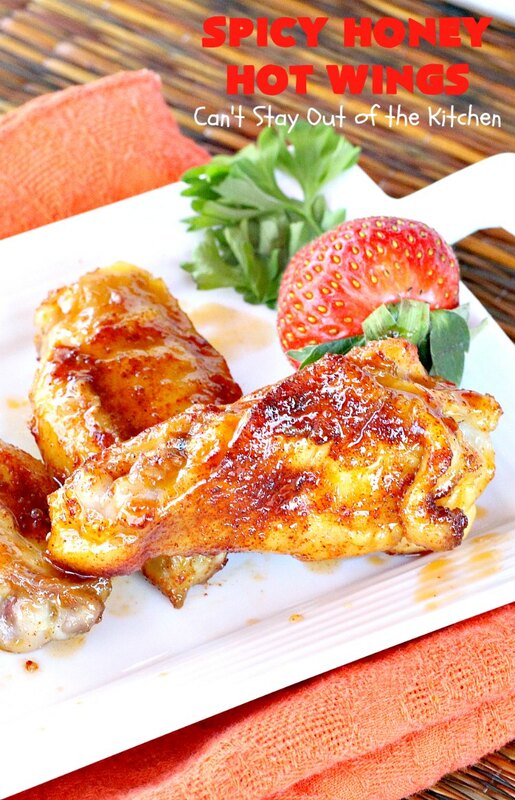 The great thing about this recipe is it’s healthy, low calorie, gluten free and clean eating! These are better if you brush the wings with the honey sauce before serving. 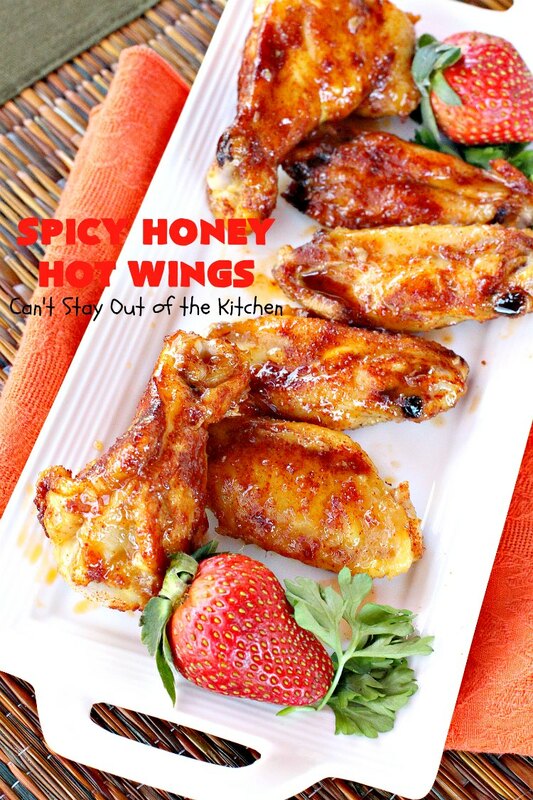 Spicy Honey Hot Wings are terrific appetizers for New Year’s Day parties, too. 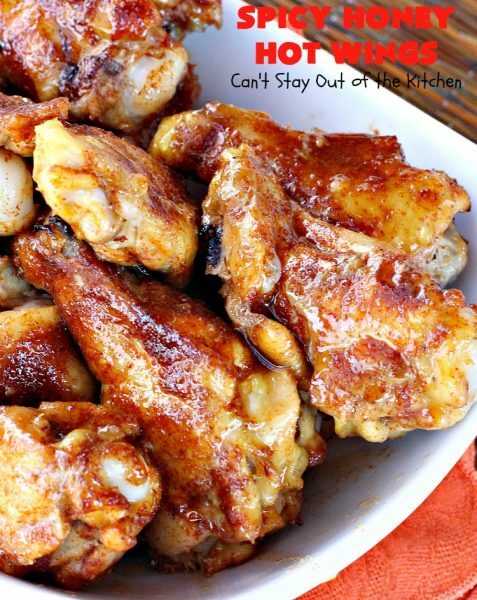 These wings look delicious, great recipe!!! Thanks, Amanda. They are great. I could eat this all the time. Thanks for stopping by.